Sam (Kelly Monaco), Jason (Steve Burton) came to General Hospital to deliver a toy for Toys For Tots. Danny said he thought Santa brought the toys. 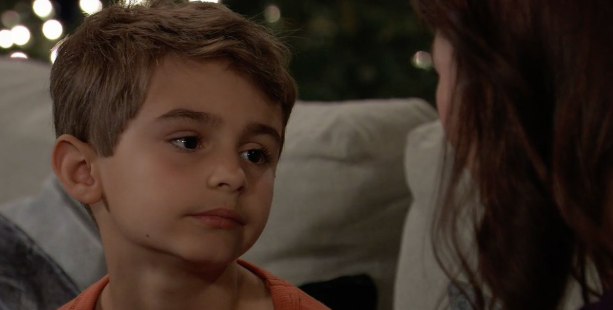 Lulu (Emme Rylan) told Elizabeth (Rebecca Herbst) that she brought Charlotte (Scarlett Fernandez) to apologize to Aiden (Jason David) for bullying him. Josslyn (Eden McCoy) told Franco (Roger Howarth) the school drama club wasn’t having a bake sale. Marcus was angry when he saw Mike (Max Gail) and Yvonne kissing. Sonny (Maurice Bernard) had to pull Marcus off his father. Confused, Yvonne insisted Mike was her boyfriend and they were going steady. Carly (Laura Wright) and Sonny tried to diffuse the situation. Carly reminded Mr. Godfrey they had to have compassion. Sam explained how Santa needed help giving toys because of the holidays. Lulu told Elizabeth how Charlotte thought she was helping Aiden to fit in. When Aiden came downstairs, Charlotte apologized for hurting his feelings. Cameron (Will Lipton) visited Oscar (Garrett Stitt). Josslyn entered with Cameron’s brownies which Oscar tried. Marcus showed Yvonne their wedding photos. Looking at the photos, Yvonne thought Marcus was her brother. Carly and Sonny told Mike that Yvonne was married, suggesting he try to help her remember when she forgot. But Mike said he couldn’t help as remembering for him was like trying to catch a snowflake. Sam told Jason about the Leland Powell situation. Aiden finally accepted Charlotte’s apology then went upstairs. Lulu assured her daughter that she and her papa would be proud of her as Laura was. Cameron gave Franco a story about the bake sale. But when the teen left without his cell phone, Franco read the text messages and realized the truth. Elizabeth assured Aiden he could talk with her, Franco, Jake and Cameron about anything that bothered him or if anyone made him feel badly. At Charlie’s to get gelato, Charlotte told Lulu and Laura she wasn’t the only one bullying Aiden and thought him weird. Aiden was playing a video game and lost. He was sad when the game displayed the message “You are a loser Aiden.” Franco said he had something to tell Elizabeth but she wasn’t going to like it. Cameron realized he left his phone. Carly, Sonny and Marcus discovered Mike and Yvonne missing. Jason told Sam all he wanted for Christmas was to spend the day with her. Jason (Steve Burton) told Sam (Kelly Monaco) she should do what she normally did and didn’t have to do anything special for him for Christmas; just spending the day with her putting together toys is enough. Sam received an email from Linda Black.The email said Linda knew what Sam did but she wasn’t going to get away with it. Jason reminded as Sam’s past was public knowledge, she couldn’t be hurt. Valerie (Brytni Sarpy) came to see Kristina (Lexi Ainsworth) at Charlie’s Pub. Margaux (Elizabeth Hendrickson) and Jordan (Briana Henry) go over the evidence in the Kiki (Hayley Erin) and Mary Pat (Patricia Bethune) murders. Jordan notices Margaux seemed to be defending Sonny (Maurice Bernard). Meanwhile, Sonny asked the staff as Turning Woods to search for Mike (Max Gail) and Yvonne (Janet Huber). Marcus said Mike took Yvonne to get away from him (Marcus). Then, Godfrey called the police. Cameron was warned he’d have more trouble if he tried to get out of the deal. Elizabeth (Rebecca Herbst) told Franco (Roger Hogwath) that Charlotte (Scarlett Fernandez) was Aiden’s (Jason David) bully. Lulu (Emme Rylan) brought Chase (Josh Swickward) some of Olivia’s cooking. He realized she was fishing for information about the murder investigations. Margaux insisted she wasn’t defending Sonny, explaining she believed he wouldn’t have hurt Kiki because of Avery. And if he wanted Nurse Mary Pat eliminated, he wouldn’t have left her head and body in public places where they’d be found. Jordan received the call about Mike and Yvonne’s disappearances. Valerie talked about how taking care of her mother limited her socializing skills. Afterwards, Kristina performed a tension relieving procedure to Valerie’s temples. Then, they kissed. Valerie pulled away reminding she wasn’t gay and stormed out. Detective Spencer witnessed Cameron’s purchasing the weed and ordered the teens to put their hands over their heads. At Turning Woods, Daisy (Kelsey Wang) told Jordan, Carly, Sonny and Marcus she saw Mr. Corbin and Mrs. Godfrey getting on a bus. Daisy apologized that for being a volunteer she didn’t assume something was wrong and never thought to stop them. Marcus wanted to press kidnapping charges against Mike. Carly called Jason. She told him how Mike and Yvonne were missing and asked him to come over to Turning Woods. When Morgan arrived, Sonny told Jason his fear that his father would panic if approached by a cop and something bad would happen. He asked Jason to take some of the Corinthos men and find Mike and Yvonne before the police did. Valerie brought the dealer and Cameron into the PCPD and Lulu called Elizabeth. When she arrived with Franco, Elizabeth demanded an explanation from her son. Finding Kristina crying, Daisy asked what happened. Learning about the situation with Valerie, Daisy said she was sorry for what happened with Detective Spencer and that she couldn’t accept Kristina for who she was but assured that those in the house would always accept her. Margaux called Sonny and told him she found his father. Margaux (Elizabeth Hendrickson) called Sonny (Maurice Benard) and told him that she found his father and a female friend outside Gemini Jazz Club. She promised to stay with Mike until Sonny arrived. Marcus insisted on coming with Corinthos to see for himself Yvonne was okay. Sonny asked Jason (Steve Burton) to take Carly (Laura Wright) home. As Nina (Michelle Stafford) and Valentin (James Patrick Stuart) were about to kiss, Valentin pulled back. He explained that although he wanted to be with her more than anything, he didn’t want her to wake up with regret. Nina assured that wouldn’t happen because she believed Valentin learned his lesson and wouldn’t hurt her again. Kristina (Lexi Ainsworth) told Sam (Kelly Monaco) that today was the day from Hell for her. Kristina asked her sister how Sam could have someone like Jason who loves her in her life and not want to be with him. Sam explained that she didn’t want to flaunt a relationship with Jason in Drew’s (Billy Miller) face. Plus, Sam wants to feel good about herself before she can feel good about renewing a relationship with Jason. Carly told Jason and vowed that if Sonny allows himself to be taken in by Margaux and cheats on her (Carly) again, she won’t take him back. Jason assured they’ll deal with whatever happened. Carly asked him to promise to let her know if he got a suscipion Sonny was leaning towards Margaux. At the PCPD, Alexis (Nancy Grahan) arrived to represent Cameron (Will Lipton). The teen said that he didn’t have crime intent; he just wanted to help a friend. Cameron explained how he thought pot brownies would help Oscar, but then decided against purchasing the weed. However, the dealer wouldn’t let him out of the deal. Elizabeth (Rebecca Herbst) reminded her son that instead of helping Oscar, he could have hurt Nero if the weed reacted negatively with his treatment protocol. Cameron asked Alexis whether he was going to jail. Alexis was able to secure Cameron’s release but told him he wasn’t out of the woods yet as he still had to go before the judge, who would make the final decision on his fate. Marcus and Sonny arrived at Gemini Jazz Club. Yvonne still didn’t recognize her husband and didn’t want to go with him. Margaux kept the situation calm by talking with Corbin about his jazz favorites. For a brief moment, Yvonne seemed to recognize her husband and asked Marcus to take her home. Margaux came back to Turning Woods with the Godfreys and convinced Marcus not to press charges against Mike. Nina and Valentin made love. Alexis came to Sam’s and told them about the pot case with Cameron. Kristina was angry when her mother asked whether she had mentioned to Cameron about Alexis taking pot when she has cancer. Later, Kristina called Daisy about moving into the house. Sonny told Margaux he owed her one when she said she convinced Marcus not to press charges against Mike. Brad (Parry Shen) and Lucas (Ryan Carnes) arrived at Sonny’s (Maurice Benard) for Wiley’s naming ceremony. Nina (Michelle Stafford) and Valentin (James Patrick Stuart) woke up in bed. Alexis (Nancy Grahan) comes over to Sam’s (Kelly Monaco) to see Kristina (Lexi Ainsworth). Maxie (Kirsten Storms) told Peter (Wes Ramsey) that Liesl (Kathleen Gati) is being transferred to Pentonville. Jordan (Briana Henry) told Liesl they’ve learned from the last time and made sure she’d never escape again. “Never say never,” Liesl smirked. Maxie reminded Peter that as Nathan’s (Ryan Paevey) mother he wouldn’t want to see her go to prison. Julian (William deVry) arrived at the Corinthos house to pick Avery to take her to Ava’s (Maura West). Sonny didn’t think it a good idea as Ava wasn’t up to looking over a child. Carly (Laura Wright) asked Avery whether she wanted to see her mommy and when the little girl said yes, Sonny relented and allowed Julian to take Avery to Ava. Before he left, Julian assured Brad, who continued to worry the truth would come out that the real Wiley died, that Wiley was where he should be. Valentin fantasized Nina received a call from her aunt and Liesl told her she was blackmailing Valentin about lying that Sasha was Nina’s daughter. Peter arrived at the PCPD and announced that as he was hallucinating he may have given a false statement when he said Liesl had kidnapped him and didn’t want a miscarriage of justice. When Jordan reminded Peter that his DNA was found all over that cabin, August explained that he was there working on a sequel to The Severed Branch. Peter added how Dr. Obretch even took care of him. After Peter signed his new statement, Jordan was forced to release Liesl. At Wiley’s naming ceremony, Sam and Michael were pleased to be the godparents. Michael in particular happy to know that he’ll get to be a part of Wiley’s life, unaware that the baby was actually his son Jonah. Willow (Katelyn MacMullen) told Chase (Josh Swickard) about her unconventional childhood. When Julian entered with Avery, he and Willow exchanged strange glances. Anna accused Liesl of having something on Peter causing him to recant his statement. 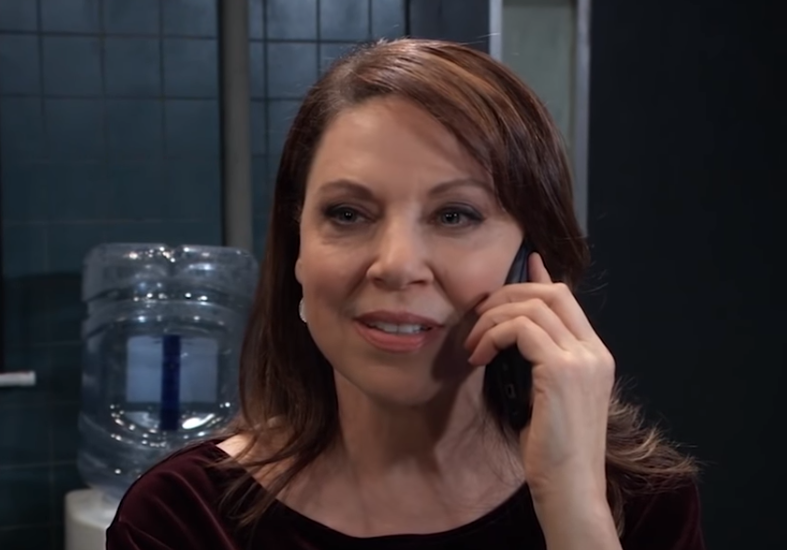 Liesl then called Valentin to tell him about Peter’s new statement and since she was now freed, she would keep her word and not tell Nina what he did. Anna asked her son why he changed his mind about testifying against Liesl. Peter explained that he was trying to work on forgiveness and being the man that Nathan wanted him to be. Anna wondered if his new founded forgiveness extended to her then invited him over to her house for Christmas Eve. When Sam returned home, she answered an email from Linda Black. Willow reacted interestingly when she saw the photo of Lucas and Wiley on Julian’s tablet. Liesl came to The Metro Court and told Maxie how Peter recanted his testimony. She learned that Michael Corinthos’ son supposedly was stillborn. Bobbie (Jaclyn Zeman) and Monica (Leslie Charleson) did rock, paper, scissors to see who would wear the Santa suit. Carly (Laura Wright) called Josslyn (Eden McCoy) a good big sister when she was able to find a hard to locate toy from the Disney Store. Josslyn commented how she wanted Christmas to be magical for Avery. Kim (Tamara Braun) and Drew (Billy Miller) decorated Oscar (Garren Stitt)’s hospital room with a small Christmas tree and lights. They gave him one gift to open on Christmas Eve: a pair of socks. But inside the toe of one are keys. Oscar is excited that he has his very own car. Curtis (Donnell Turner) and Jordan (Briana Henry) came over to Anna’s (Finola Hughes) for her Christmas Eve celebration. Anna was pleased when she opened the door and found her son on the other side as she didn’t expect Peter (Wes Ramsey) would attend. While putting her donations into the General Hospital Toys for Tots box, Maxie (Kirsten Storms) was surprised to run into Amy’s brother Chad. Willow (Katelyn MacMullen) came Charlie’s Pub to see Julian (William deVry). It was revealed that she was the birth mother. She remembered how Jerome came to her classroom and Julian convinced her to give away her son. Julian told Willow she made the right decision adding her son is having a great life surrounded by two loving parents and extended family. Willow wondered whether it was possible to be a part of her son’s life in some way as she looked at photos of Wiley on Julian’s tablet. Cameron (Will Lipton) worked on an apology letter to the judge when Franco (Roger Hogwarth) entered with Jake (Hudson West) and Aiden (Jason David). Apparently “Santa’s elves” (The Webber boys) were less than helpful and Franco had to carry in all the firewood himself. Cameron proved he was a good big brother by giving little brother Aiden advice on how to get girls to like him. Cam reminded that third graders can be stupid, telling Aiden not to let it get him down. At Anna’s holiday party, Peter learned that she makes a donation to schools in need on his birthday. Anna gave Peter a flash drive of her WSB file as she didn’t want there to be any secrets between them. Maxie almost knocked over Anna’s tree. Holding Wiley, Jason told Lucas (Ryan Carnes) how Michael taught him how to be father. At first Josslyn blamed Jason for not telling her about Oscar’s cancer when he first found out, but after Morgan explained his reasons she forgave him. Mike and Sonny reminisced about a past Christmas. Stella came over when she learned what happened with Yvonne. Oscar met a little girl suffering from cancer who was afraid Santa wouldn’t be able to find her in the hospital this year. Bobbie told Monica there was a small problem with the Santa suit. Monica read “Twas the Night Before Christmas.” Bobbie donned the suit and dressed as Santa Claus.